The remaining gears and axles of 260 417 are cleaned and oiled. 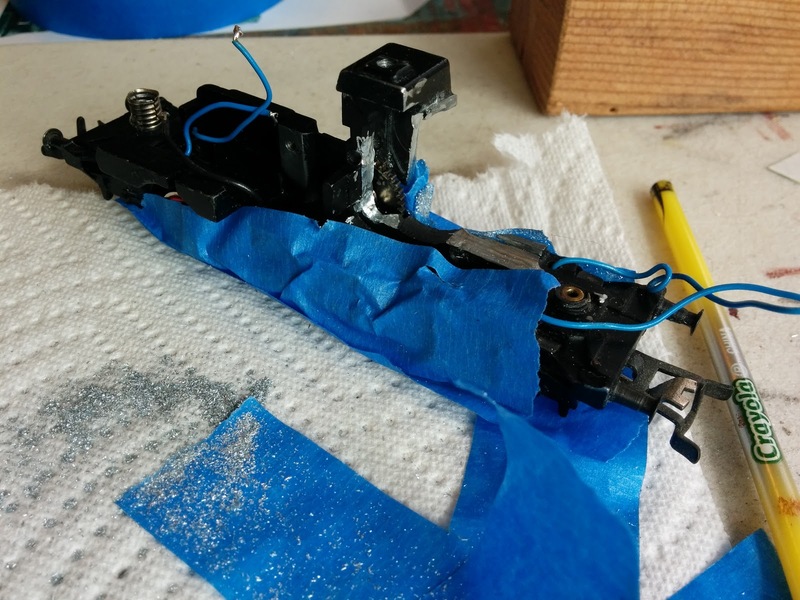 Now I just need to find some quiet time to prepare the epoxy glue and get the motor glued in place. They needed to bring in the big crane to clean up this derailment near Mount Marvel at Silicon Valley Lines. 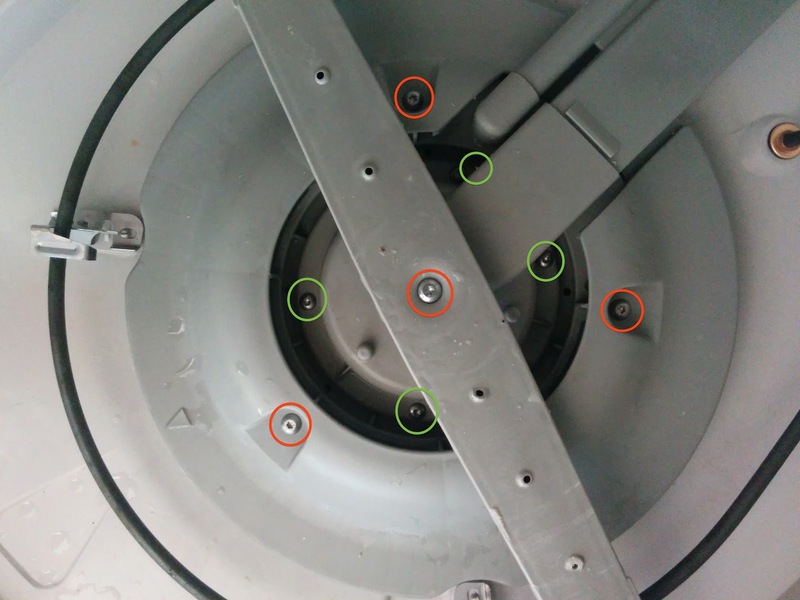 Today, I cleaned up some imperfections with the metal work from Friday and for the first time tested the new motor with the simplified drive-train. 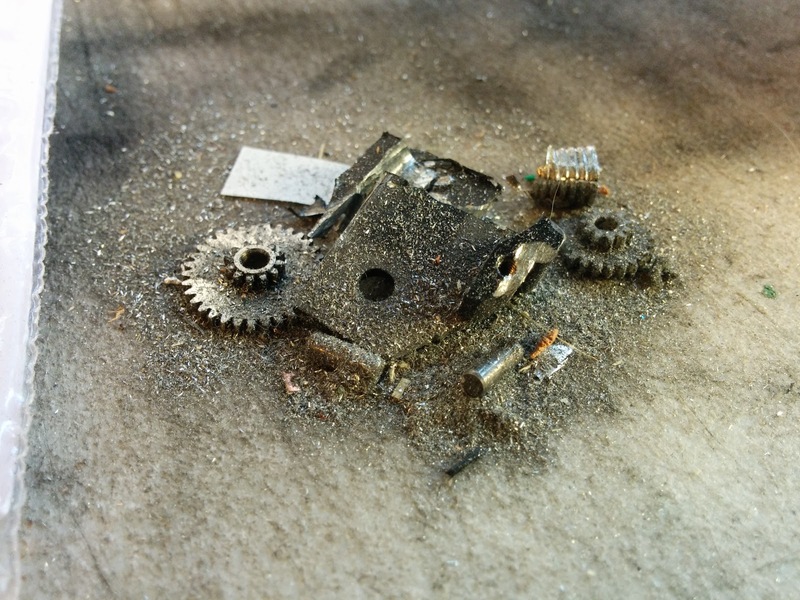 I'm quite pleased with the result, even with the gears still dirty and a bit sticky from sitting in a box for over 25 years. 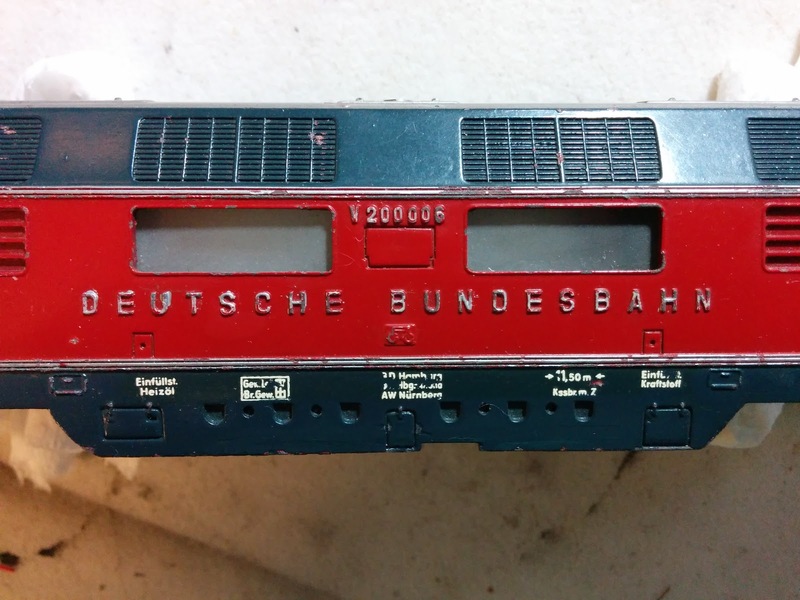 This is the ubiquitous Maerklin 3065, DB number 260 417-1 a first generation switcher for light and medium duty switching, as well as light transfer freights. This is my next victim for conversion to digital. I'm doing this one differently than all the other conversions so far. 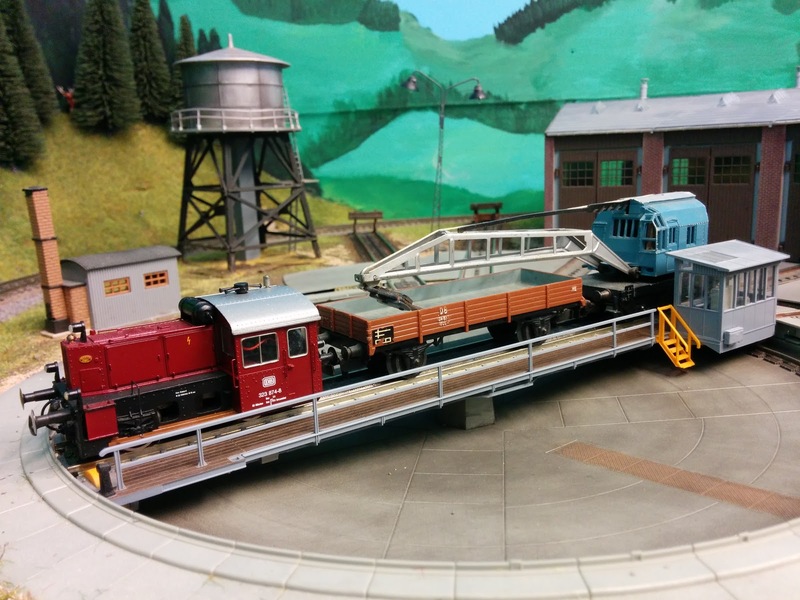 The motor in this locomotive is awful and the gears are super-noisy. 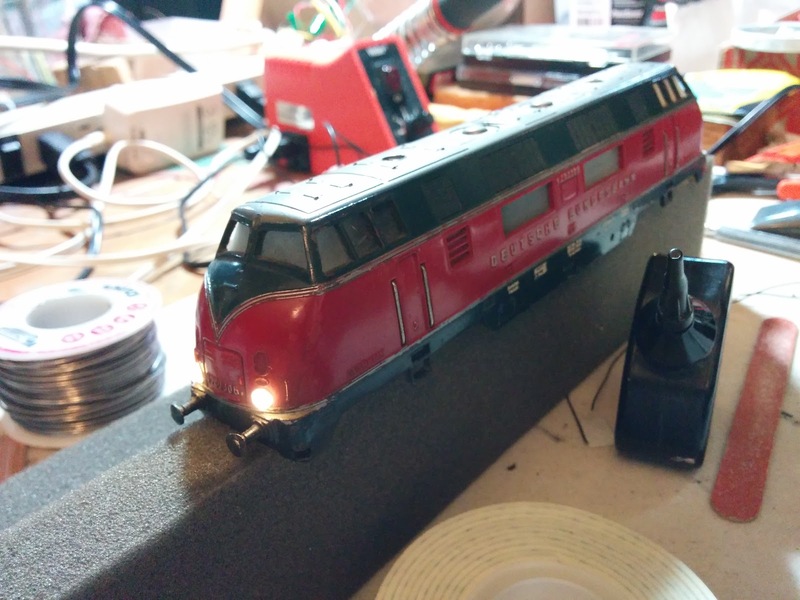 Two years ago I ordered a re-motor kit from SB Modellbau that fits this locomotive. 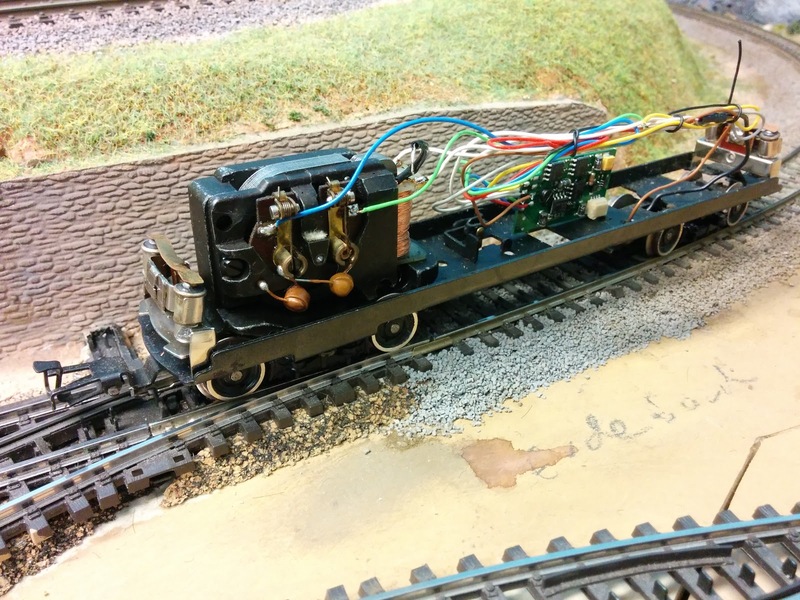 It consists of a small Maxon DC motor, and adapter gears to fit into the Maerklin drive-train. This promises a much smoother running engine and I heard many good things about the SB Modellbau motor kits. 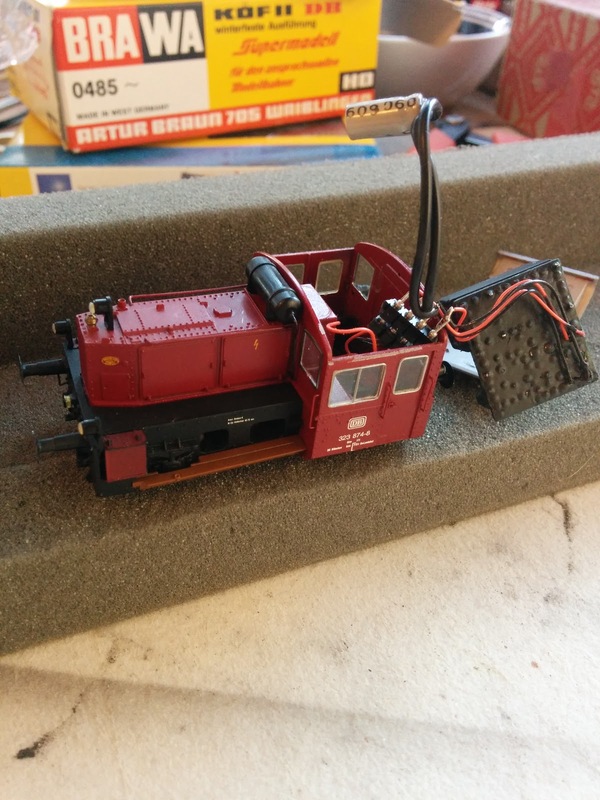 The only catch is that doing this conversion requires extensive modification of the motor block, thus the kit is labeled as "difficult" on the SB Modellbau Web site. "There is no difficult", I thought and ordered the kit. I've never done a conversion like this before. 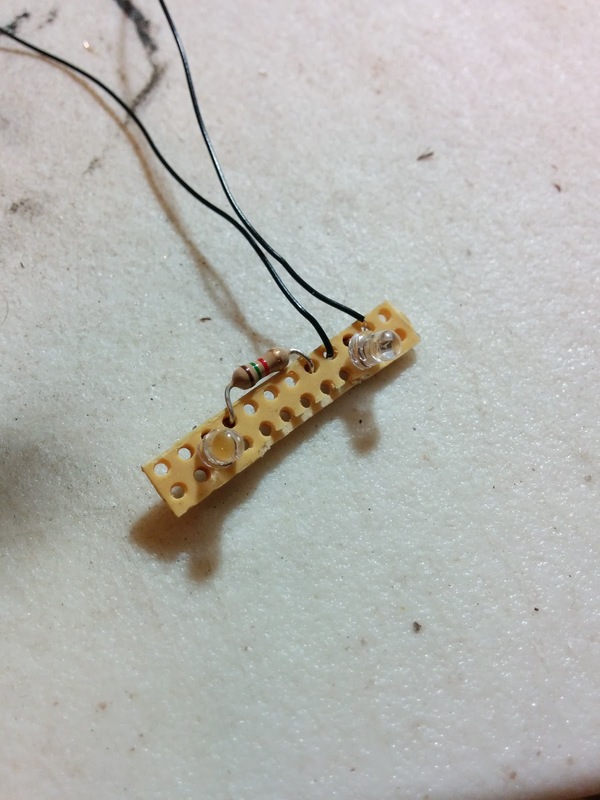 You can send the parts to SB Modellbau to have the milling done professionally for a fee, but I wanted to try myself. 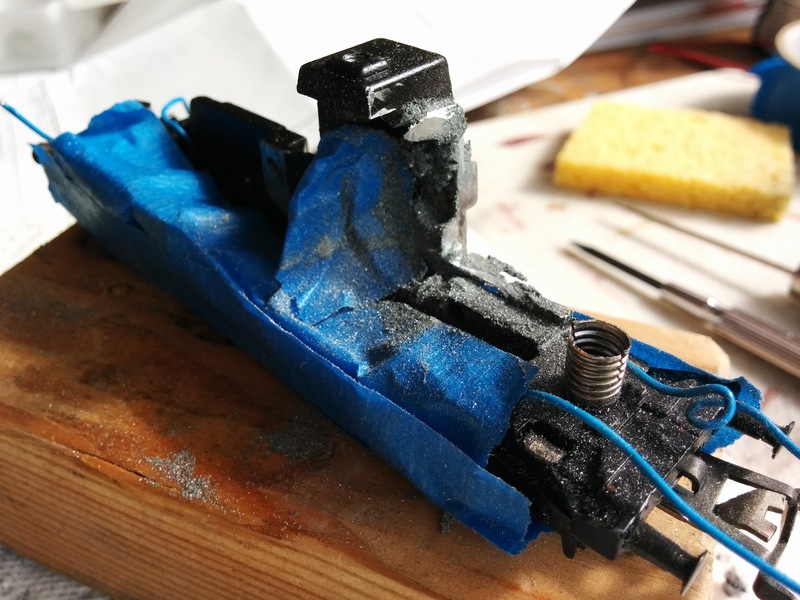 Today I worked up the courage to start grinding away the motor block with a cut-off disk in the Dremel and working out the more intricate bits with a milling bit. 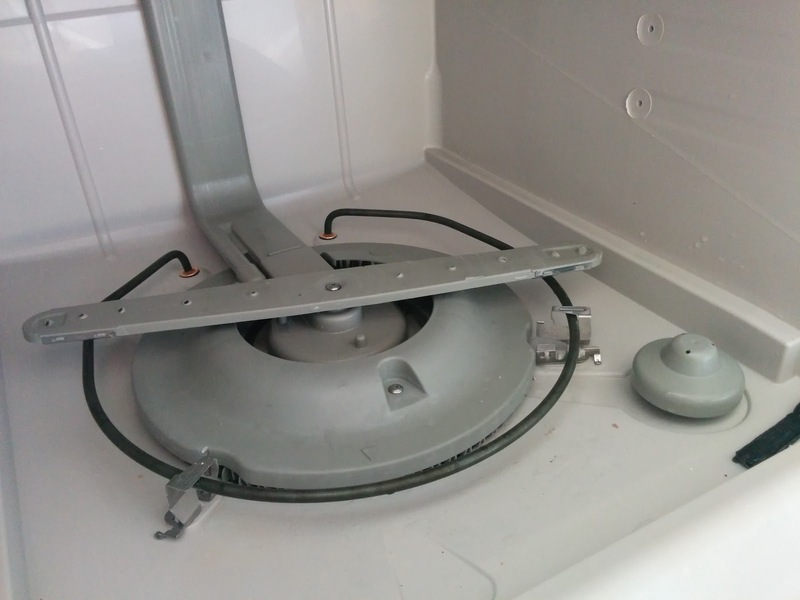 The zinc metal is relatively soft, so a fresh cut-off disk worked very well. The milling bit is a bit harder to control, but manageable at low speed setting. 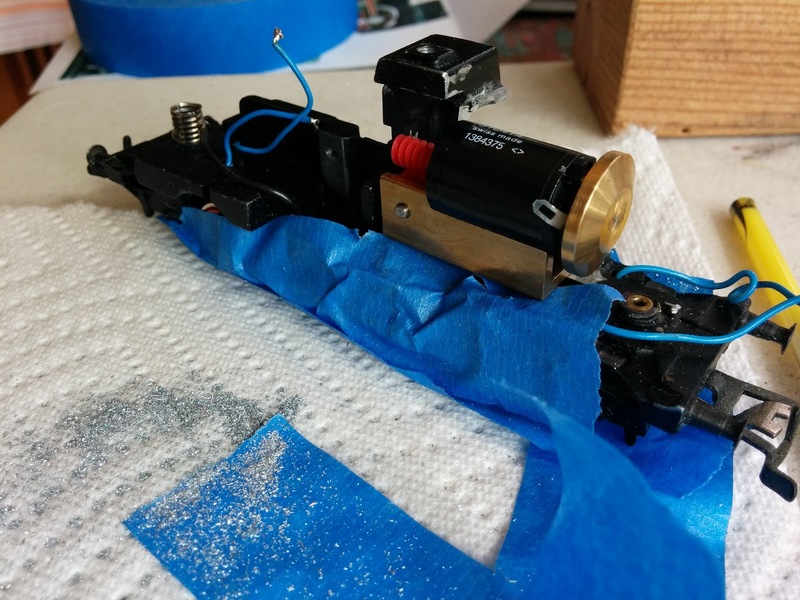 I used painters tape to keep the metal shavings away from gears and wheels as much as possible. A couple days later I did the first test run. 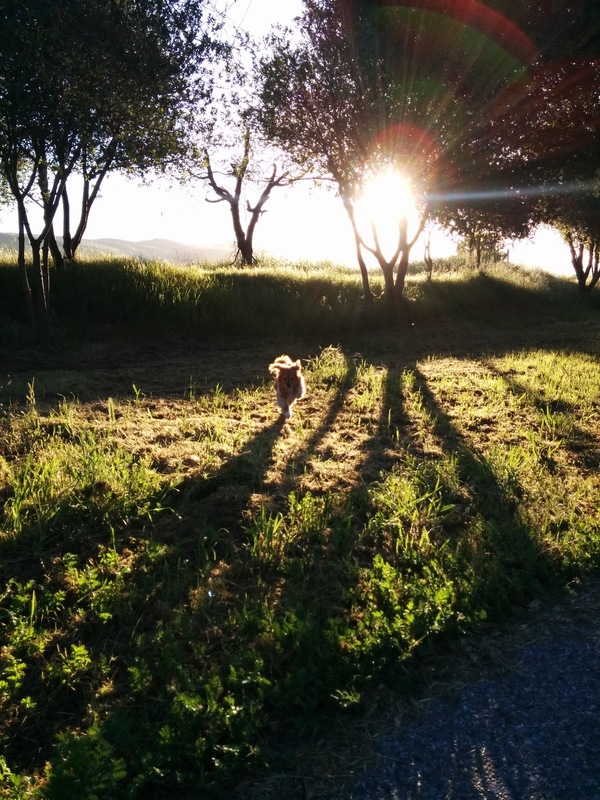 One of the nice things of being up early and dropping off the kids at school is a walk with the dog along Coyote Creek Trail. 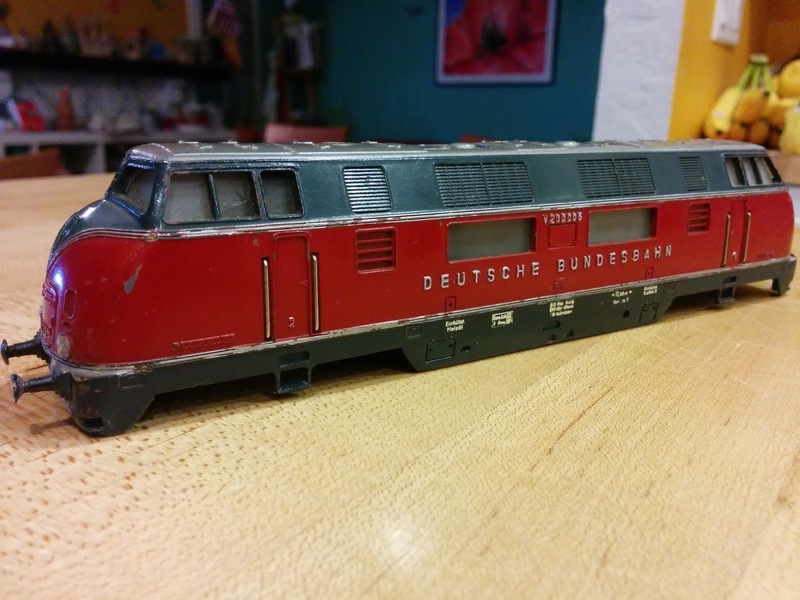 The digital conversion of the V200, Maerklin model 3021 is done. 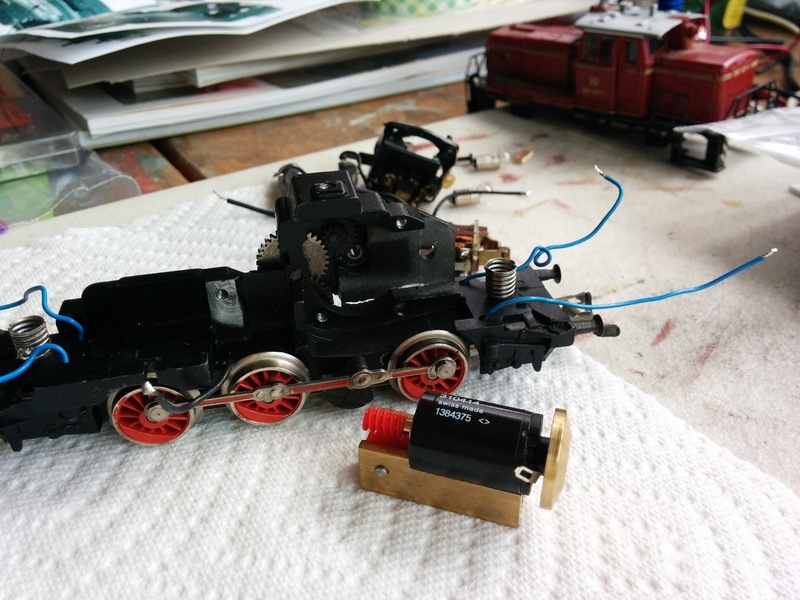 Since I had the lights and decoder working already, I just needed to put shell and chassis back together. 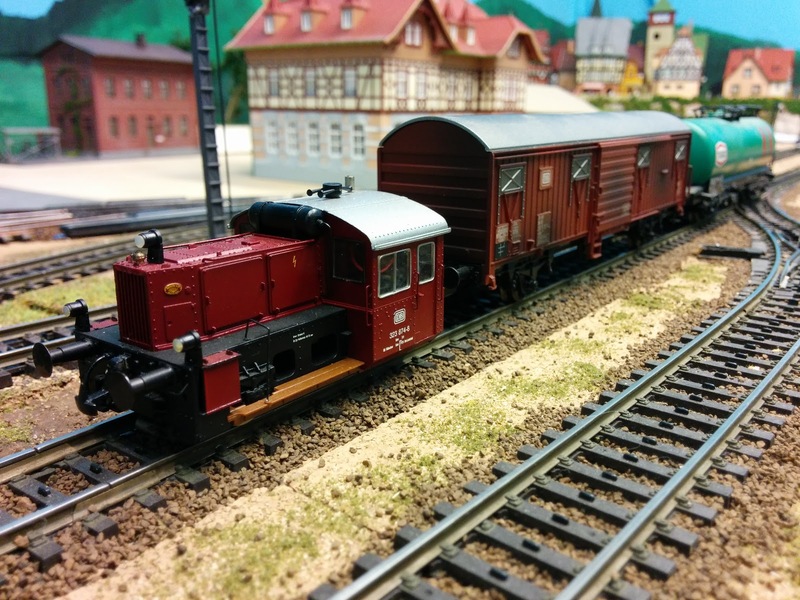 Here is a quick run-by in Talheim with an express train made up from appropriate vintage tin plate passenger cars. This is the last post on the V200 conversion. The earlier posts are part 1, part 2, and part 3. 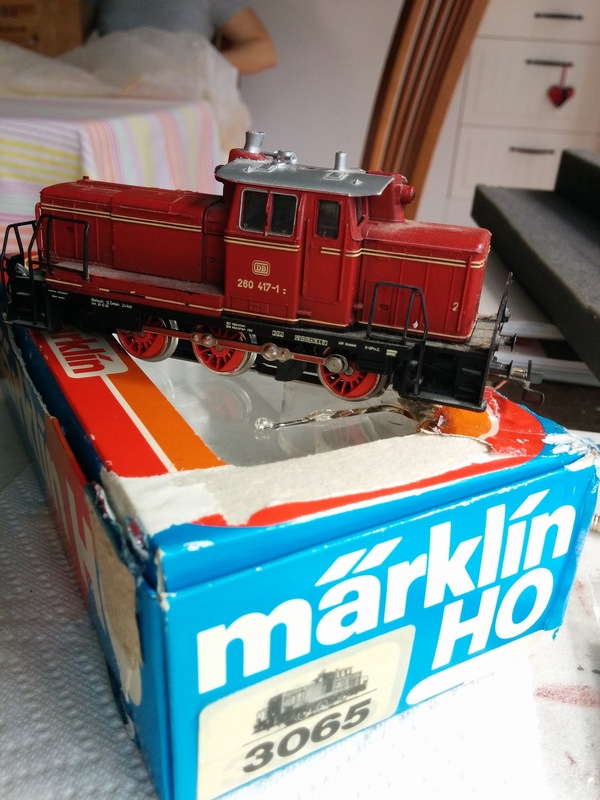 Since I already decided that I would rip out the analog insides of this Maerklin 3021 and put a decoder in I did not want to keep the original light package either. I do want to do the model justice and keep the outside appearance as it was manufactured in 1958, thus I'll refrain from drilling out the 3rd headlight which is merely suggested by a bit of silver paint, as much as that offends my prototype instincts. 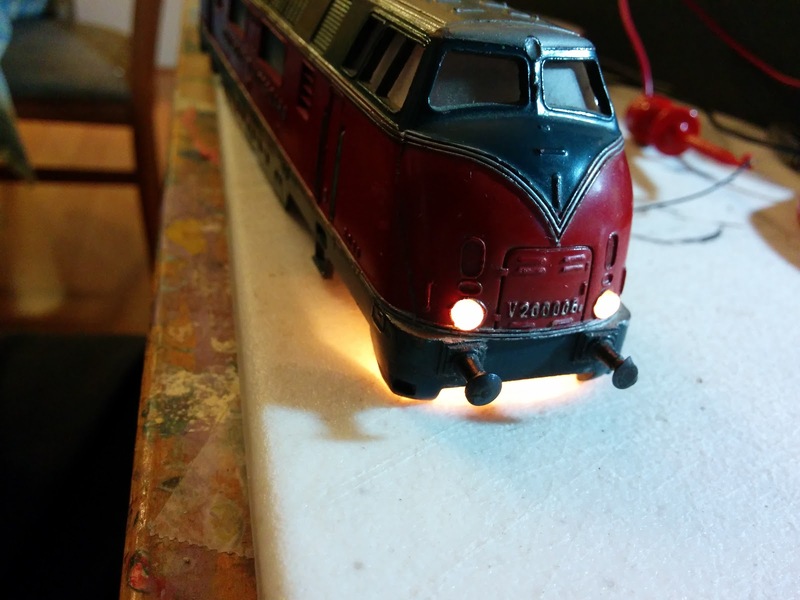 I built a new light-board from some strip board and DCC-friendly 14V miniature light bulbs. 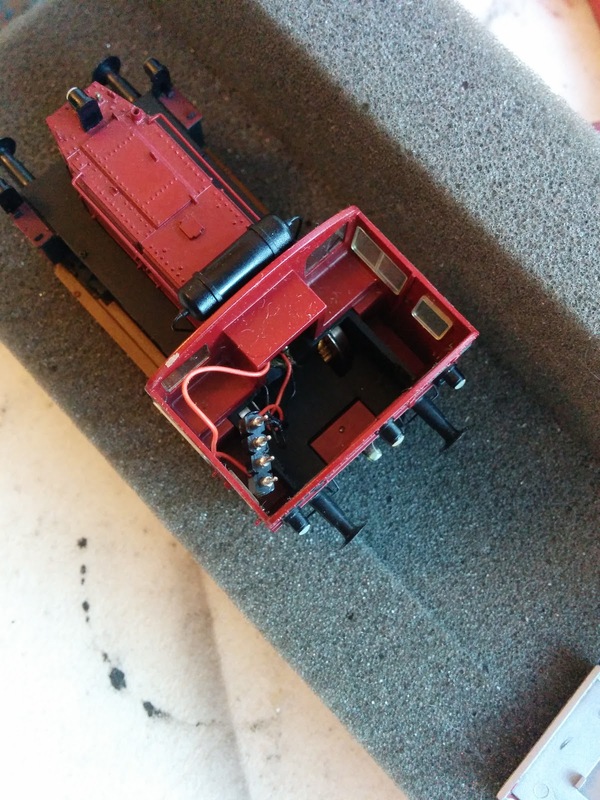 I used some stacked styrene bits and double-sided tape to mount the board inside the locomotive shell, carefully paying attention to leave enough room for the motor assembly right next to it. 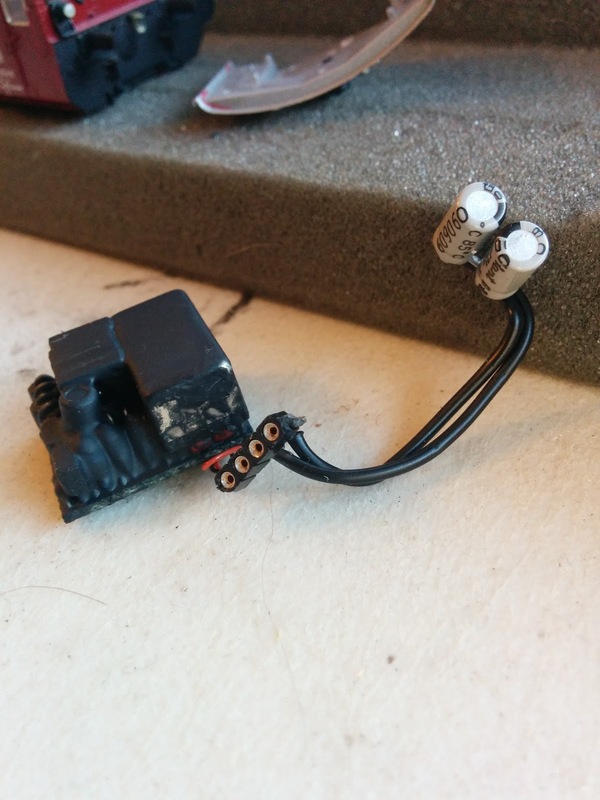 I hooked up my workbench 12V power supply and ... was underwhelmed. Yes, the lights look ok. In fact they are looking better than with the original light package, but if I'm going through all this trouble might as well choose something with less maintenance burden. 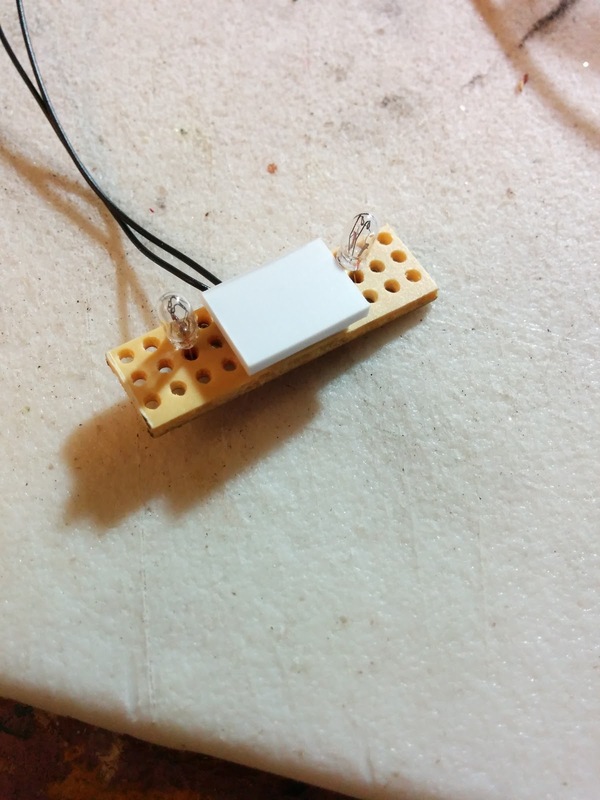 I remembered that I still have a pack of 3mm warm-white LEDs in my supply cabinet, and built a light-board with two LEDs arranged in series, protected by a 1.5kOhm resistor. After taking the photo I glued the stack of styrene and double-sided tape to the light-board assembly and mounted it the same way as the first one. The light looks similar and this was a somewhat pointless exercise after all, but now the old lady has LED lights. Woot. 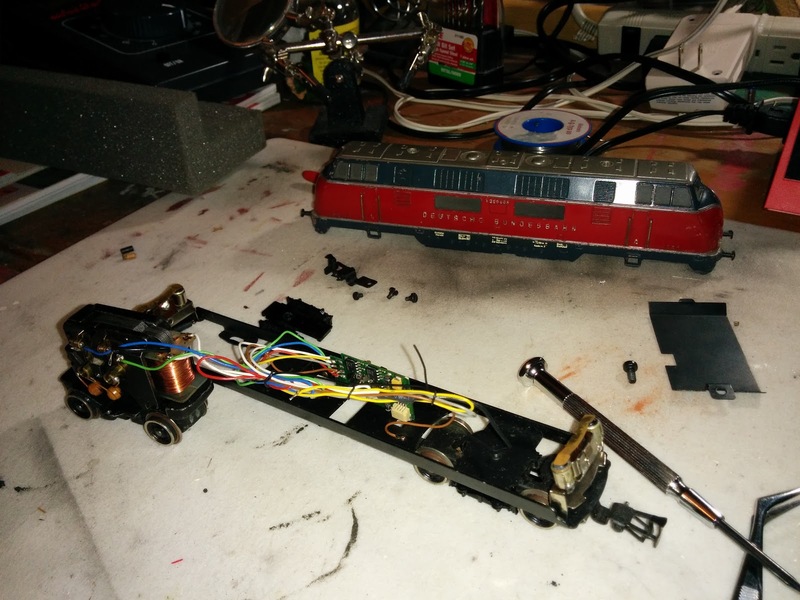 Time to wire up the lights with the decoder in the chassis and see how well this all works on the layout. 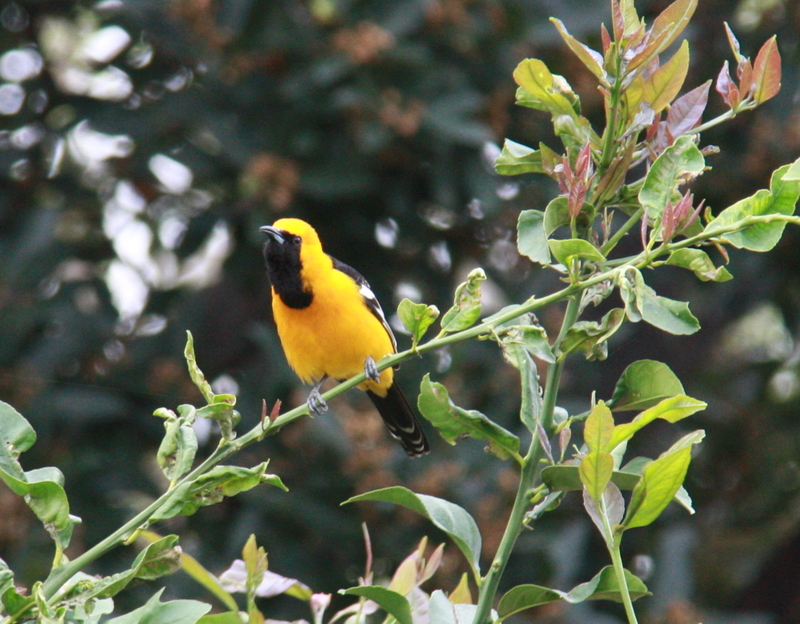 "Hey look, there's a Hooded Oriole in our Lemon tree!" It was raining this morning. I had to drive to the office instead of taking the bus as usual. It appears people are unable to refrain from having accidents when you drop a cup of water on the road. 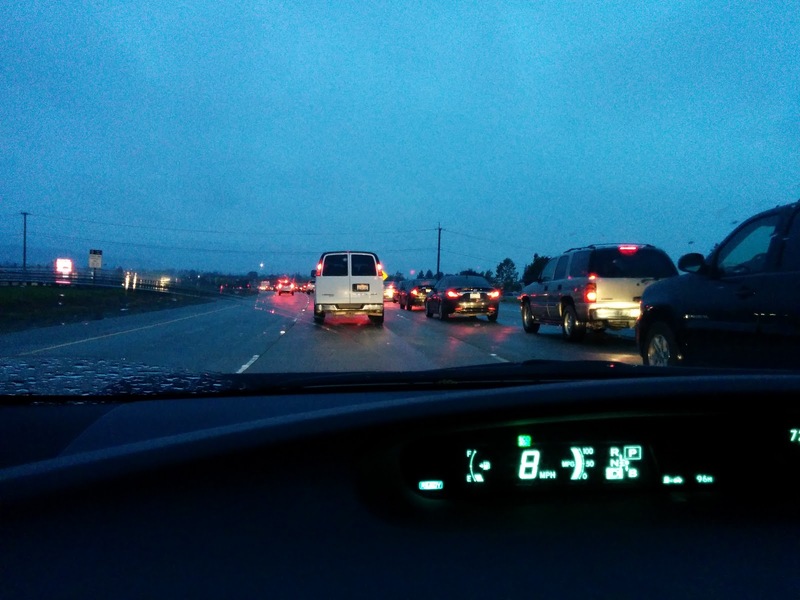 Total drive time from south San Jose to Mountain View was over 90 minutes today. 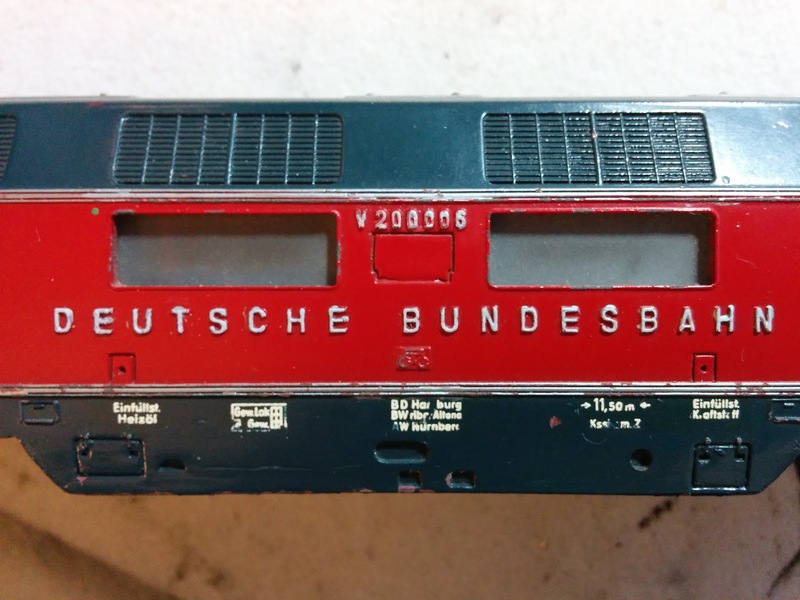 The paint on the V200 Maerklin 3021 is showing signs of its age and eventful life. 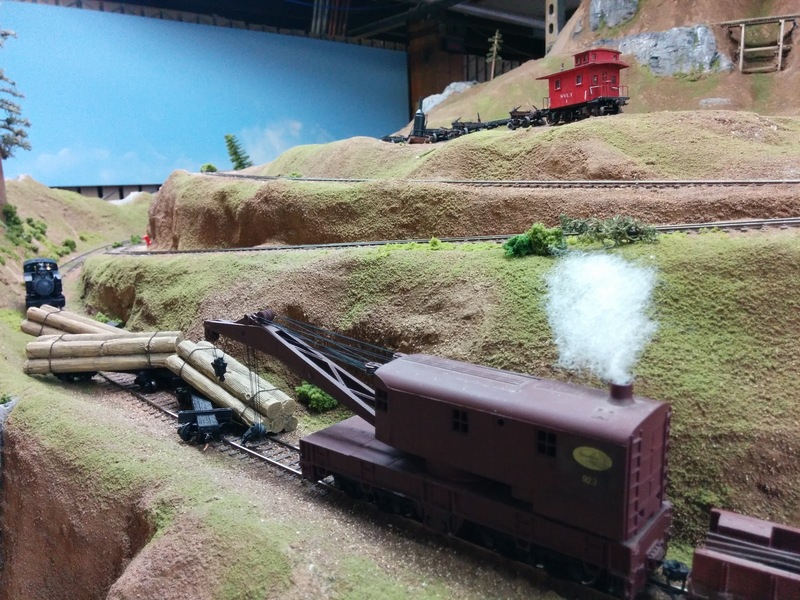 This doesn't look particularly good as a close up, but the impression of the locomotive improved dramatically from merely fixing up the lettering on the side. At the moment I'm not planning to do a wholesale repaint of the body of the loco but rather leave most of the scruff marks. After all, it's almost 60 years old. It's allowed to have a few wrinkles. I used an ESU Lokpilot 3.0 as the decoder for the Koef. When closing the roof I noticed that the decoder just barely doesn't fit. The LokPilot Micro version would actually fit under the roof as designed. 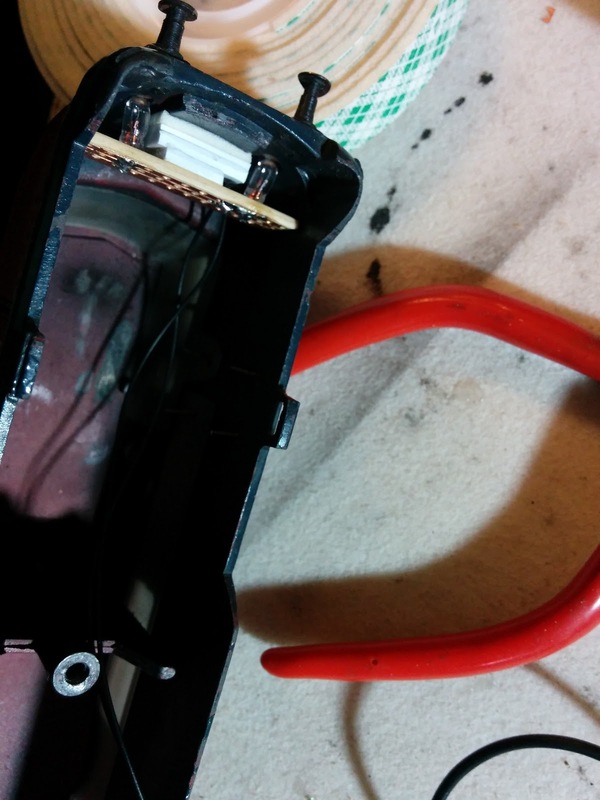 I squeezed the decoder into the cab for now. Wires be damned. To finish off the evening, here's a short video of the Koef in Talheim. Instead of a screwdriver, I used a wooden clothes pin to push hard against one edge of the Koef roof and it just popped off. No damage to the roof or the body of the locomotive. 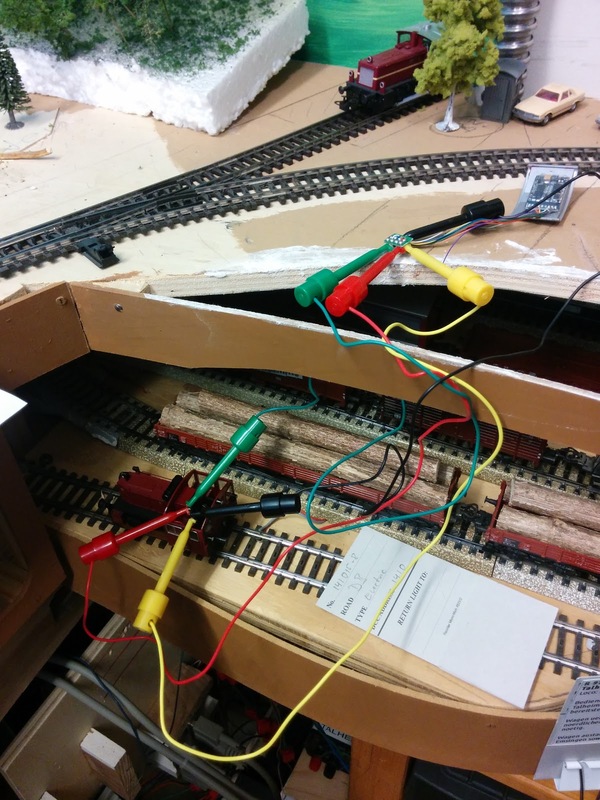 The cab housed a shrink-wrapped assembly to make the loco work with Maerklin-style AC power, and includes two capacitors wired in series to provide some extra juice for dead spots. View into the cab with the connector leads to motor and pickups.